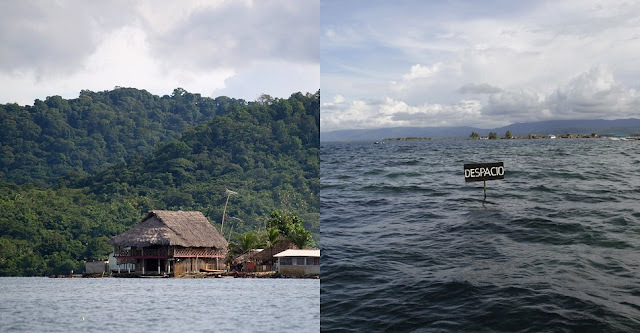 If someone says the climate crisis is a hoax, show them this. 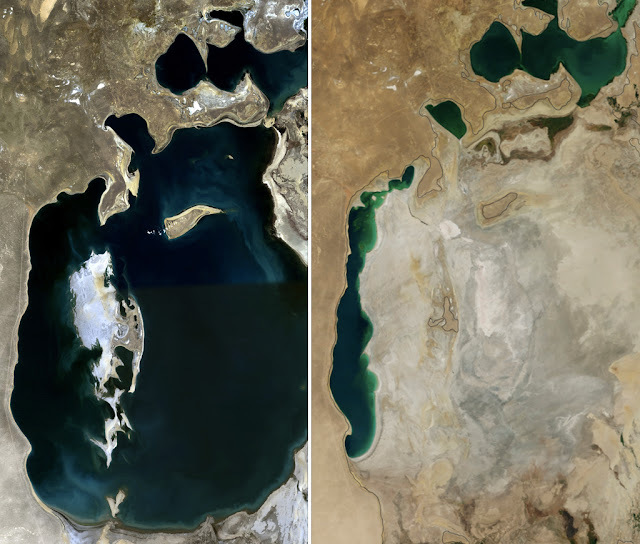 The climate crisis is becoming more apparent, when looking at recent photos of lakes, archipelagos, and coral reefs and comparing them to photos taken 20 years ago — and in some cases, just a decade ago. As the ozone layer continues to evaporate and polar ice caps continue to melt, this causes erratic weather patterns and dramatic sea level rises. NASA is now saying that global sea levels could rise by as much as three feet in the next century. The Enterprise Bridge passes over a section of Lake Oroville in 2011 (left) and 2014 (right) in Oroville, California, which is experiencing “exceptional” drought. 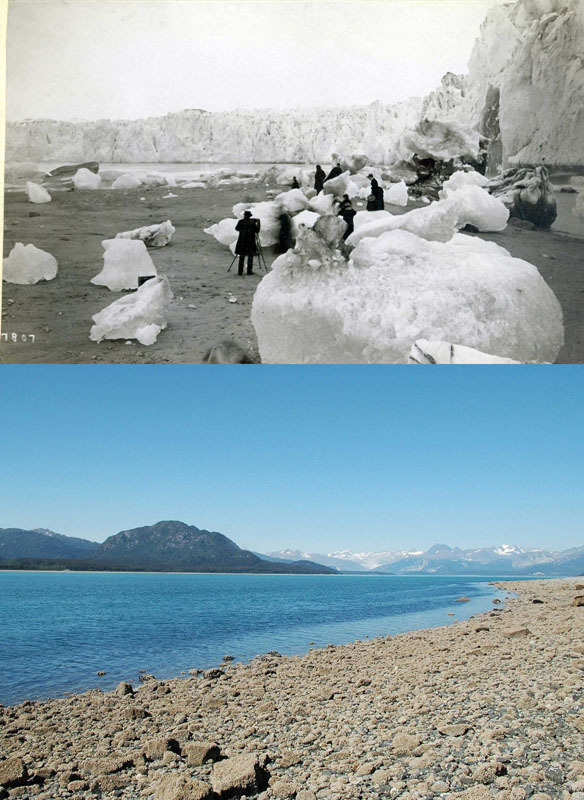 To further document the progression of global warming, the U.S. Geological Survey is working on a project using a method called “Repeat Photography,” that is helping the public visually learn about how global warming has accelerated the melting of glaciers over the past 100 years. The results are shocking, and speak for themselves. 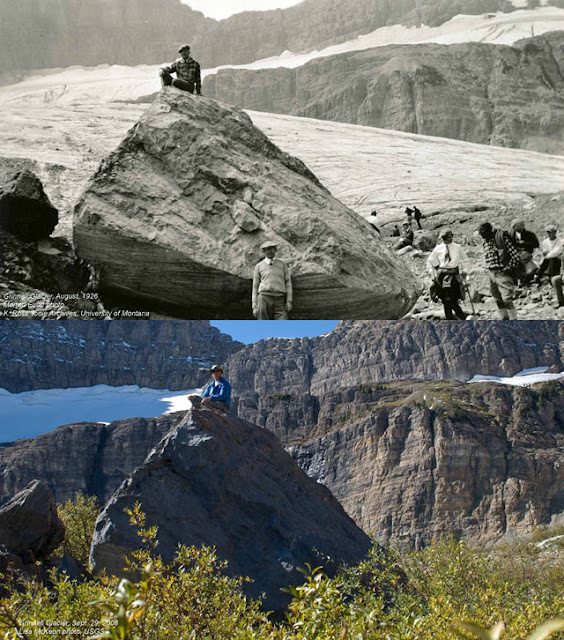 The USGS is using various photos from the 1800s to the early 1900s to demonstrate how glaciers used to look, and photographers are taking photos of the same landscapes to show how things have changed – and continue to change to this day. The project is covering Montana’s Glacier National Park, as well as public parks and forests in Alaska. In the 1800s there were 150 glaciers at Glacier National Park, of which only 25 remain. 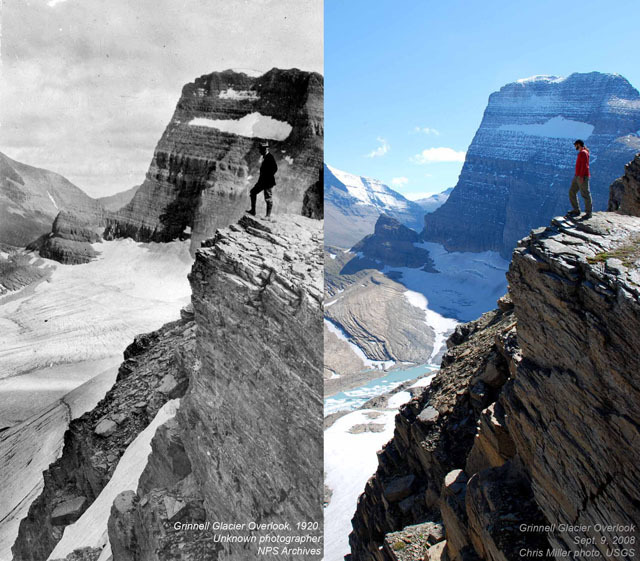 1920 and 2008: Grinnell Glacier Overlook in Montana. 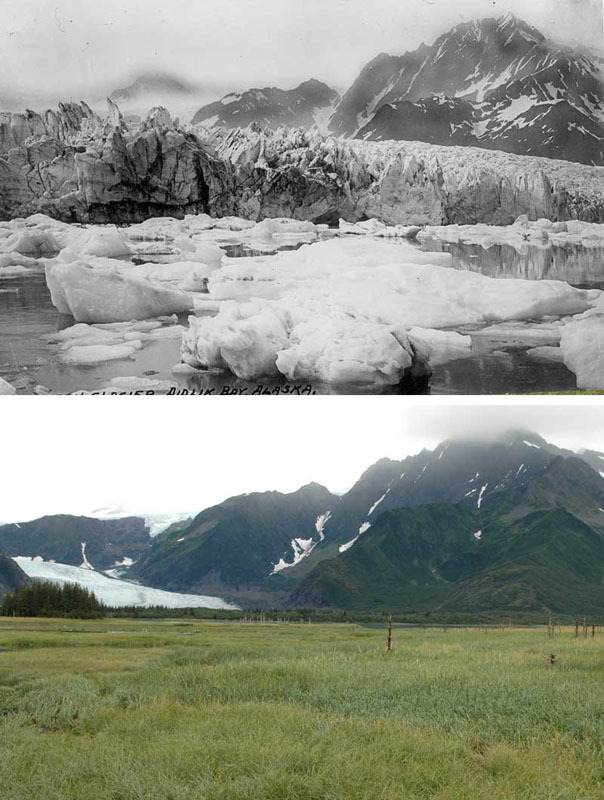 As the USGS’ documentation shows, the receding of glaciers in the continental US and in Alaska are drastic. The receding of glaciers began to accelerate to an even greater rate in the 1980s, when the effects of global warming began to take hold. It has been predicted that if something isn’t done, Glacier National Park in Montana will be completely glacier free by 2030. 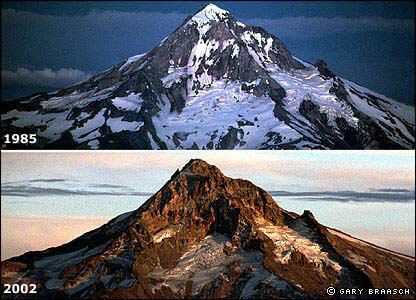 Current climate change trends absolutely must cease to preserve these glaciers. USGS Aquatic Entomologist Joe Giersch says that small aquatic insects could be the first victims of the melting glaciers. Glaciers affect the delicate balance of nature, in a top-down fashion: Animals that are used to a colder climate will be particularly vulnerable to the effects of global warming, as they have specific food needs that the colder climate provides. One example from the above video is that the size of glaciers in Montana directly affects the huckleberry crop, which is a vital food source for grizzly bears. 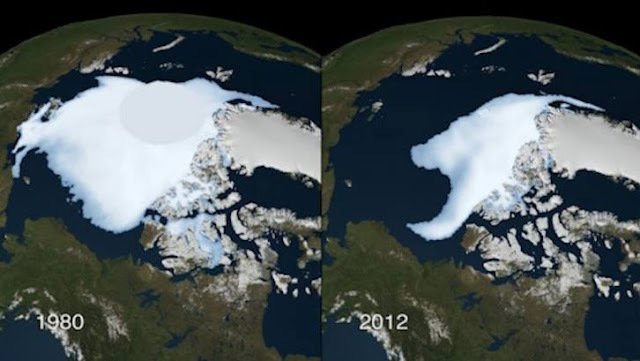 This scientific evidence is coming to light while Russian president Vladimir Putin is claiming that global warming is nothing more than a western “fraud,” and while the Justice Department is being pressured to investigate an ExxonMobil Climate Change cover-up. This is all despite the fact that approximately 97 percent of actively-publishing climate scientists — a virtual consensus — agree that rising temperatures are due to human activity. This post was republished from usuncut.com/. You can find the original post here.